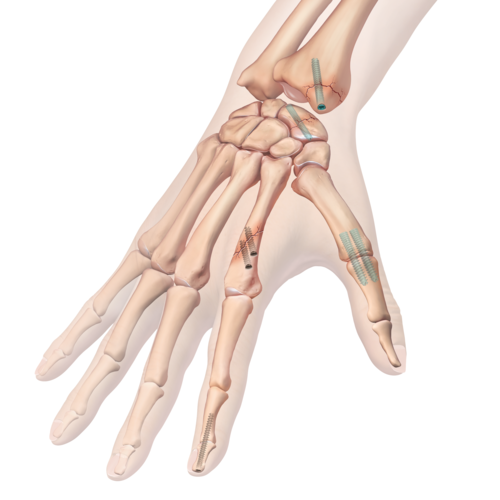 A fracture of the hand is a break in one or more of the bones that makes up the hand or fingers. Fractures of the hand may be caused by trauma. Sports injuries, falls or direct blows to the hand can also lead to fractures. Punching an object is a common cause of a hand fracture. Pain, swelling and loss of motion at the affected area of the hand are common findings. Swelling, bruising and tenderness to the touch may be present on physical exam. Grip strength is decreased compared to the opposite hand and a 'click' may be palpated at the fracture site. The patient will be asked to turn their palm up and make a fist. This test allows the surgeon to check for rotational deformities in the fingers caused by the fracture. X-rays will help confirm the diagnosis. Non-displaced fractures of the hand can be treated non-operatively. Immobilization in a position of function, using a cast or splint is recommended for 6 weeks or more. 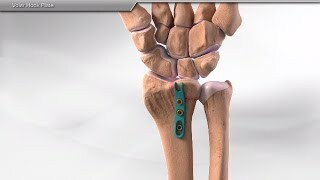 Displaced fractures may be pinned in place or fixated with a plate and screws. Once the fracture fragments have healed, therapy will be initiated to regain strength and motion.